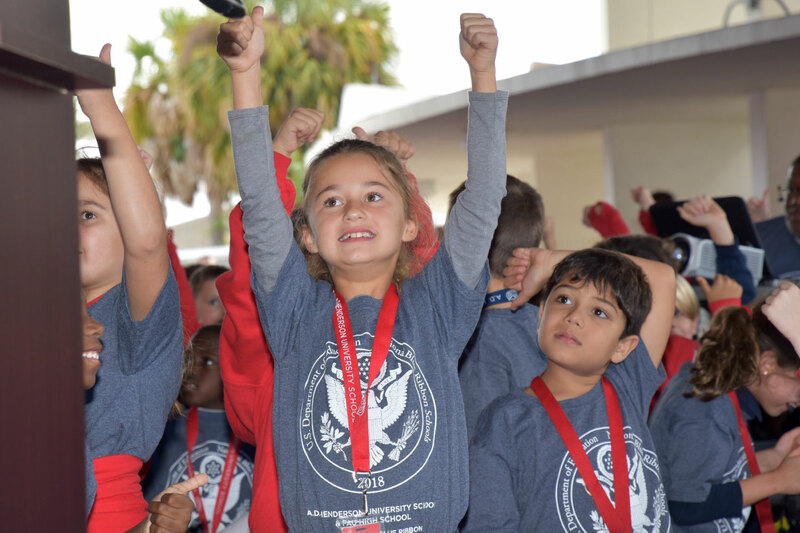 Florida Atlantic University’s A.D. Henderson University School (ADHUS) unveiled its National Blue Ribbon distinction awarded by the U.S. Department of Education at an announcement ceremony today. Leadership from FAU and ADHUS, along with the entire ADHUS’ student body, Boca Raton City Council members and others, gathered for the official unveiling of the Blue Ribbon seal. The event celebrated the school’s recognition as an exemplary high performing school based on overall academic performance. ADHUS was one of 12 schools in Florida to be named a National Blue Ribbon School. The coveted National Blue Ribbon Schools award affirms the hard work of educators, families and communities in creating safe and welcoming schools where students master challenging and engaging content. ADHUS is a Title 1, K- 12 public laboratory school under the auspices of the State University System of Florida as part of FAU’s College of Education. The chief state school officer of Florida nominated ADHUS for this national recognition. At least one-third of public schools nominated in each state must have student populations of at least 40 percent of students from disadvantaged backgrounds, and all of the schools must also meet the state’s annual measurable performance targets. Now in its 36th year, the National Blue Ribbon Schools Program has bestowed recognition on more than 8,800 schools. U.S. Secretary of Education Betsy DeVos, along with other members of the Department of Education celebrated with honorees at an awards ceremony in November in Washington, D.C.
For more information on A.D. Henderson University School, visit adhus.fau.edu.